Here’s another comic from the strip Grandma by Charles Kuhn. Some how it seems that the previous barefoot comics we’ve seen from this strip, here, and here, have a bit of a negative take on it. Today’s strip is no exception. I suppose it’s clever and thereby funny, but kids all knew back then that springtime would be a bit oochy, but then the your feet would quickly toughed up for a summer of barefoot fun. They looked forward to that. Here’s a comic from July 11th of last year. 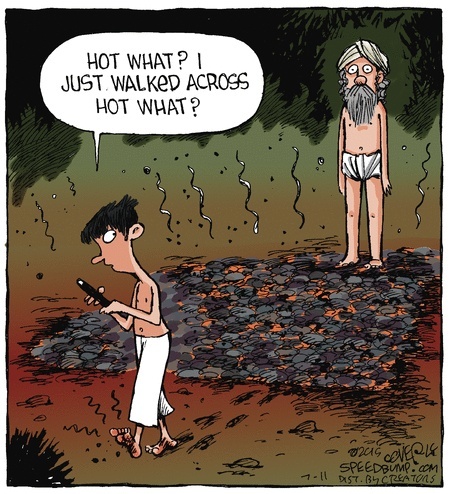 It is from the strip Speed Bump, and while it’s not really about bare feet, it is connected. Here’s our comic for today. It’s from the strip The Ryatts, which ran from 1954 to 1994. This one appeared on May 1, 1971. This is what kids used to look forward to at the end of winter.